If you want that undeniable grunt and rumble on your vehicle, then upgrading your exhaust system will soon have you turning heads. We stock Legendex exhausts that are built tough. They are made from 409 grade stainless steel right here in Australia. If you want a performance product that is designed to meet the needs and demands of driving off-road in the Australian outback, on a 4WD track or when hitting the highway, then you will love the Legendex exhaust system. Built for even the toughest terrain, this heavy duty exhaust system has greater durability and life expectancy when compared to other heavy duty exhaust systems on the market. Eat up the hills and mountains with the power gained from upgrading to a Legendex exhaust system. DO YOU WANT improved towing AND fuel economy? Gain at least an extra 10% power (excluding DPF equipped vehicles) in the rev range when climbing those tough hill tracks and towing. When combined with the PCM chip, you can typically expect to get a power gain of 20 to 35%. 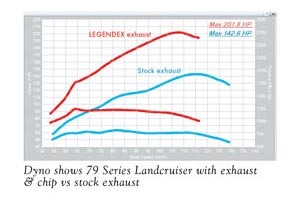 Combine this with a fuel saving of 8 to12%, and you can see why the Legendex exhaust systems are so popular. [Note: A Legendex exhaust will not void your new vehicle warranty – so it is the logical choice for easy power gains]. Do you know another company who provides a warranty on their exhausts for when you’re heading off-road? Probably not, because Legendex are the only brand who carries a warranty that covers you off-road. The Legendex products are built tough and confidently offer an unrivalled 10 Year Warranty. If you’re looking for a new exhaust system fitted to your vehicle in Toowoomba, then be sure to drop in and see the friendly Mick Tighe 4x4 & Outdoor team at 190 Herries St, Toowoomba.